This unforgettable scene from Oliver Twist, first serialized in Bentley's Miscellany -- where exactly in the imagination of Charles Dickens did it take place? Ruth Richardson, a British historian and preservationist, stumbled upon an amazing answer to this question while advocating against the demolition of the Cleveland Street Workhouse, one of many extant London workhouses like the one described in Oliver Twist. This old building turned out to have a special significance, unknown at the time to the entire world. Charles Dickens, she discovered, had lived on the very same block during several of his turbulent childhood years. It's not clear why this fact was unknown, other than the fact that the street's name had changed, obscuring its illustrious history. Charles Dickens had grown up impoverished, a factory child laborer, and did not relish sharing personal details of his upbringing after he became famous. His childhood addresses were not a secret to researchers today, but obvious clues were not followed, leaving it to Ruth Richardson to put the evidence together and prove conclusively that Charles Dickens had grown up on the same street as a workhouse for impoverished adults and children that would certainly have been his model for the early scenes of Oliver Twist. 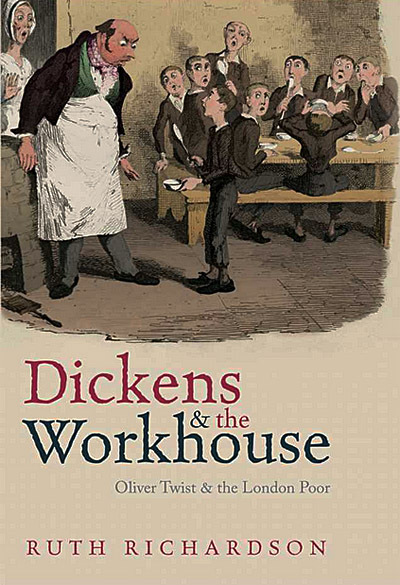 Dickens and the Workhouse: Oliver Twist and the London Poor is Ruth Richardson's record of her discovery, and an informative look at the milieu behind Dickens's powerful story. Attitudes were polarizing at the time: sympathy for the lot of the poor was giving way in powerful places to a level of harshness and unconcern previously unknown. At the time, a wave of political agitation was running in favour of much greater democracy, both nationally and locally, and huge numbers of people were mobilizing in support of parliamentary reform. But in many quarters this movement fed old fears of the Gordon Riots of 1780 or of the French Revolution, and many supporters of reform recognized the need to extend the franchise so as to prevent revolutionary fervor. So while the idea of greater democracy had wide support, part of the push for change had a hard edge of parsimony and retrenchment on the part of property owners, of pulling up the ladder. Here, Richardson's observations appear eerily relevant to current controversies in the United States of America (though this book was first published in England a couple of years ago, and is certainly not intended to refer directly to the Paul Ryan budget or the latest "New Poor Laws"). The book emphasizes economic over literary history, and much of it is slightly too detailed for my tastes (I think I would have enjoyed it more if I knew the streets of London better, because I often felt I was missing necessary local references). But if the book sometimes lacks clarity, it makes up for this in enthusiasm whenever Ruth Richardson revels in the sheer joy of her original discovery. How often does a 21st century historian come face to face with something as wonderful as an unknown corner of Charles Dickens's world? Ruth Richardson lets the thrill of discovery animate this book, and it's a pleasure for any reader to share. She has followed this book's publication with further Dickens-related discoveries, including the fanciful unearthing of a few real-life contemporaries and neighbors of young Charles Dickens with names like Bill Sykes, or Goodge and Marney (the possible source of Scrooge and Marley?). These characters all lived in the neighborhood known as Merylebone, near the site of the Middlesex Hospital, where the orphan Oliver Twist has once again been found. 2 Responses to "The Workhouse"
Death, Dissection, and the Destitute is the one I want to read. I love these story behind the story type books, kind of like a vh1 behind the music for literature.